Carnegie Hall's JapanNYC festival kicked off on Tuesday in a city-wide celebration of Japanese culture that resumes in March & April 2011 to complete its 65 events. This week's launch (consisting of three concerts) commenced with Artistic Director Seiji Ozawa conducting the 26-year-old Saito Kinen Orchestra, which he co-founded with fellow conductor Kazuyoshi Akiyama to honor his late mentor Hideo Saito. Tuesday's concert consisted of Beethoven’s Piano Concerto No. 3 (with soloist Mitsuko Uchida), Brahms’s Symphony No. 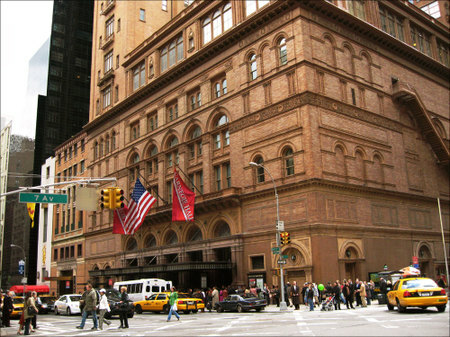 1 in C Minor, and the U.S. premiere of a Carnegie Hall commission, Atsuhiko Gondai’s Decathexis, both Ozawa and Tatsuya Shimono sharing in the conducting duties, earlier cited for health reasons. Above the Maestro pauses for an adorable breath. Below, Uchida takes a bow (with Shimono on the far left and composer Atsuhiko Gondai rocking the red jacket). The last resident moves out of the 116-year-old studio apartments in Carnegie Hall Tower. 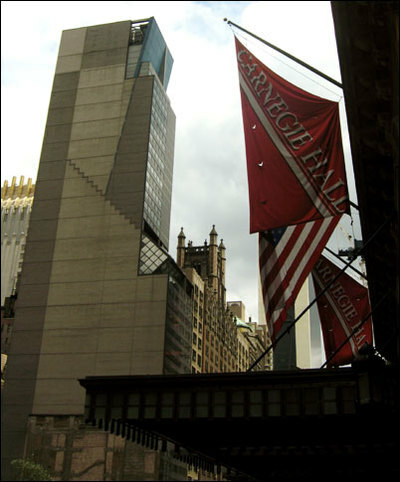 The commerical and residental studios are being demolished to create new spaces for Carnegie Hall. New York Times photographer Bill Cunningham says goodbye [video]. GAME ON! Grandmaster Flash at Carnegie Hall: Seriously. Tonight at Carnegie Hall, legendary old school rapper/turntableist and former Sugarhill gang-member Grandmaster Flash speaks on a panel for GAME ON!, where he'll be addressing the future of music and video gaming (Mr. Flash will be a character in the Activision video game DJ Hero, launching next week). Other panelists include Melissa Auf der Maur, former member of The Smashing Pumpkins and Hole; Alex Rigopulos, co-founder and CEO of Harmonix who created Guitar Hero and Rock Band; Christopher Tin, video game composer; and Meghan Asha, talking head technology specialist. So where's the token panelist who only listens to anime soundtracks? Moderating is Pete Wentz, the Royal Prince of Guyliner and lead singer of Fall Out Boy -- the same guy who named his first child "Bronx Mowgli". The panel will conclude with an afterparty at the Nintendo World Store at Rockefeller Center. Power up! What Opera Chic can exclusively reveal is that Barenboim, now that Mike Mussina has officially retired, will officially do a try out for the New York Yankees -- a lifetime of piano playing apparently gave Barenboim a mean, mean slider. 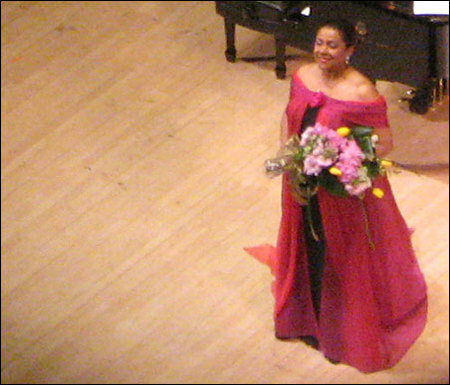 It's been 14 years since she was fired from the Metropolitan Opera by then General Manager Joseph Volpe, and 6 years since she's sung at Carnegie Hall, so New York was more than ready for Kathleen Battle's Sunday afternoon come-back recital at Isaac Stern Auditorium on 57th & 7th. After 2 & 1/2 hours of Kathleen Battle charming the audience with her still-sweet lyric soprano, half-a-dozen standing ovations, and three generous encores, NYC unanimously was like, "This is luv". OC was proud to be among the fans, casual in black suede Gucci wedge boots, rag & bone str8 peg-leg denim, a black cashmere Brioni cape, and black Chloe Paddington bag. Battle, true to legendary status, scripted herself a true diva's entrance. Instead of the predictable singer's entrance from backstage, the first performer on stage was instead lutenist Daniel Swenberg, who came out and began playing his theorbo, a type of olde-skooly lute. Just as the audience was hypnotically lulled into the soothing, understated purity of the theorbo, the stage door flew open, and Kathleen Battle came gliding out. As the audience bloomed with applause (ending in a standing ovation before the diva even birthed a single note), Battle graciously acknowledged her fans. Hair pulled neatly into a bun, an absence of bling (aside from gold sandals and earrings), Battle was in a two-layer, off-the-shoulder dress (an under-sheath of black silk topped with two gauzy layers of magenta and red, cleaved in the middle and trailing on the floor) which provided mild consternation for the diva through the performance, fussing playfully with the gauze train that refused to cooperate whichever way she moved. The first three selections were by Henry Purcell, accompanied by the theorbo. As Battle launched into her first work, her voice wrapped around the hall as comfortable as a vintage Pringle cashmere blanket, a Comme des Garçons silky t-shirt, a velvety soft pair of 7 For All Mankinds, or a pair of ballet-slipper-soft Louboutins. Such a familiar voice that belies the diva's upcoming 60th birthday. Still sweet as honey, with tinge of woody richness that foreshadows her years to come. Battle's voice is pretty much ageless, and sweet bubbles still froth at the surface of her tone, that same youthful tone that she mastered two decades ago. Time for the Franz Schubert selections, and Battle was joined by pianist Ted Taylor. Battle was comfortable on stage and worked the audience well (who were all too eager to reciprocate), easily mastering a dramatic scale from sassy to tender, introspective to poignant. Nacht und Traume was short and sweet, while Versunken was troubling, one of the only struggles from the program. Between selections, Battle would mentally prepare herself, turning her back on the audience and channeling herself as the audience waited in complete silence at her shoulders. The standout from her Felix Mendelssohn set was Fruhlingslied, which she attacked immediately, a voice tireless and confident. She carried perfectly in the hall, cold killin' it. 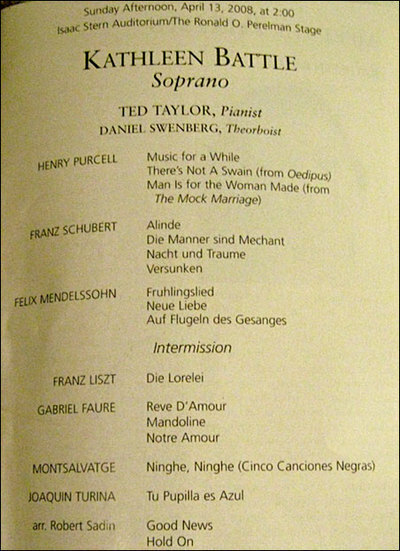 At the end of Fruhlingslied, pianist Taylor left the stage to retrieve a handkerchief for Battle to wipe away renegade sweat, while she softly apologized to the audience. After the intermission, Battle slayed Franz Liszt's Die Lorelei, a potent, memorable standout of the recital, showing off a voice that was impervious to breakage, cobwebs, or cowbells, as if it had been shelved and air sealed the past dozen years. Gabriel Fauré's French selections were overall sweet and lovely, Battle singing in a clear voice. For the last Fauré, Notre Amour, she mastered a delicious vibrato. It wasn't until Montsalvatge's "Ninghe, Ninghe" (Cinco Canciones Negras) that the sweetness worked against her. OC thinks such a lush, vivid song would have benefited better from a sultry wash, but Battle turned it towards a lullaby-ish predictability, sweet, but too timid. Joaquin Turina's Tu Pupilla es Azul was a stark contrast to the prior work, and Battle unleashed her full powah, sloughing the paint from the hall, to which the audience reciprocated with applause peppered with whistles. But that was just a warm-up for her stellar, off tha hook (and a complete surprise, excluded from the written program), "Were You There When They Crucified My Lord?” Tremble, tremble indeed. Battle transformed herself into mechabattle Battle, and the gloves came off. The pianist excused himself, and Battle began the hymn alone, paced and solemn, voice easily filling the 3K capacity auditorium like a mousie in a matchbox. omg, who is this woman? bangin. the whole hall. spotless. o the powah! Before the next selection (coincidentally a world premiere, never heard before a live audience), Robert Sadin's "Hold On", she spoke again, extolling the composer. She explained that he was a loyal friend and vocal coach from the beginning of her career (having met him in Cincinnati, he was the mentor for her first opera performance in Barbiere). The work was commissioned for Battle by Sadin, and was in the style of an African-American spiritual. At the end of the song (that spoke of holding one’s hand fast to the plow), Battle was floored, having poured her family legacy into the spiritual (Battle's grandfather was an emancipated slave, a man-made trauma that holds much resonance with the singer). She was gracious to give three encores to the adoring audience, singing "O mio babbino caro" from Gianni Schicchi. Flawless, and it was the perfect antidote to erase the bitterness of OC's last live Lauretta (Nino Machaidze’s colic version at la Scala a month ago). The second bis was "His Eye is on the Sparrow", another gospel hymn about Jesus stuff, from 1905 by composer Charles H. Gabriel, which was kinda yawnz0rs. Her last encore (although for technical reasons, it had to be the last…as her voice abruptly failed at the end) was another spiritual, "Swing Low, Sweet Chariot". Regardless of the fact that a forced note lodged in her throat -- which came out as a cough mid-measure -- Battle sang this one again without any accompaniment from pianist Taylor. She paced the stage dramatically as she laid down the tracks. At the end of the work, the diva was showered with much deserved, deafening cheers, the audience hoping to make up for the years of her censored and silenced absence from the NYC stages. It was a comeback perfectly practiced and planned, paced and understated. We were all too happy to welcome her back, and hopefully this time, she won't stay away so long.